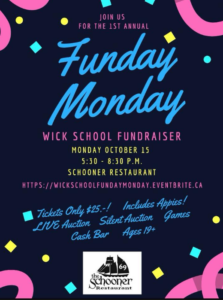 Join us for the first ever FunDay Monday, organized by the WEPAC (Wickaninnish Elementary Parent Advisory Council)! Silent and live auction plus games! $25 per person includes appies. Buy tickets with Rebecca at the school OR use this link. Funds raised will go toward building an outdoor cultural learning space at the school.